With Scott Pruitt out at EPA, many agency watchers have cautioned that his successor may be more skillful at rolling back environmental safeguards. Environmentalists and even some industry lawyers have long criticized Pruitt for cutting corners while rolling back rules. That made him an easy target in the courtroom, prompting numerous judicial rebukes for procedural missteps he directed over the past year. A more careful approach to deregulation from acting Administrator Andrew Wheeler or a future appointee could mean fewer legal hiccups for EPA. "I do understand the point of view that he is more dangerous potentially to the environment because he really does understand how Washington works," UCLA law professor Sean Hecht said. But environmentalists maintain that while they may be less likely to catch Pruitt's successor red-handed in short-cutting administrative processes, they'll still have plenty to work with in the courtroom. "Even if they clean up their act on the procedural stuff, I think on the substance they still have problems," Sierra Club attorney Joanne Spalding said. Litigation targeting the Trump administration's environmental rollbacks includes a combination of process- and substance-related challenges. EPA hit procedural roadblocks early on when it tried to suspend Obama-era methane standards and when it delayed other rules. The substantive challenges are playing out more slowly. 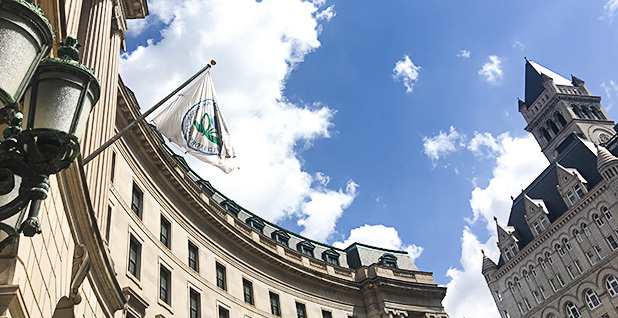 As EPA goes through the traditional notice-and-comment rulemaking process to rescind or rewrite rules, the agency develops a record justifying its decision, which will then be reviewed in court. Several marquee Obama administration programs, including the Clean Power Plan, are still inching through that process, meaning Pruitt's explanations for sidelining those rules haven't landed in court yet. Bethany Davis Noll, litigation director for New York University's Institute for Policy Integrity, argued that environmentalists will likely have an advantage in those inevitable legal battles even if Wheeler and future EPA leadership meet all procedural requirements. "They have an edge because the original rules were issued with really significant and substantial economic support that is hard to turn your back on," she said. As Wheeler takes the helm at EPA, many experts expect him to continue on an aggressive deregulatory course but with greater attention to administrative rules. "If I were in Wheeler's shoes, I would go back to my general counsel and my senior staff, and I would ask them to look at literally every action that Pruitt has initiated with an eye toward figuring out if it needs to be withdrawn or modified in some way," Hecht said. That would include a number of major deregulatory plans — the methane standards, the Waters of the U.S. rule, the Clean Power Plan — as well as proposals that would change how the agency operates, like the so-called "secret science" rule limiting the types of research used to craft regulations. Noll said several of those proposals are fundamentally flawed, not just in process but in substance. Because the Obama administration carefully laid out economic analyses that showed dramatic benefits from instituting the new rules, EPA cannot now justify a rollback without "monkeying with the math," she said. "There's still the requirement that the agency grapple with and explain the decision to forgo really significant benefits, and from what we've seen so far out of the agency, they can't really explain the decision to forgo those benefits without sort of monkeying with the math, mangling the math," she said. Environmental lawyers point to the agency's rationale for withdrawing the Clean Power Plan as one example: The Trump administration estimates dramatically lower climate benefits and higher compliance costs than the Obama EPA anticipated. That's because this administration changed the way it calculated air pollution costs, energy efficiency benefits and global climate impacts (Energywire, Oct. 10, 2017). Clean Power Plan supporters have criticized the changes as arbitrary and misleading and are expected to rely heavily on those arguments in eventual court proceedings. "If they continue down that road of repealing those, they're probably going to have to engage in monkey business, and that's not going to help them," Noll said. Stuart Shapiro, a regulations expert at Rutgers University, said Wheeler could restart some of those processes to address potential legal vulnerabilities. But that would give EPA a tight time frame for completing the process. "Starting over is not easy," Shapiro said. "He could go out and pick any one of Pruitt's proposed rulemakings and say, 'We've received a lot of negative comments; we've rethought our approach to this; now we're going to do something else instead.' That's certainly plausible and feasible and maybe even advisable from a legal standpoint. "The problem with that is whether or not he can do that, get comments again, do an analysis again, get [an Office of Management and Budget] review again and get it out by January 2021," he added. "It's definitely not easy." Natural Resources Defense Council attorney John Walke rejected the notion that Wheeler would even want to change Pruitt's approach for any of the rollbacks. "Scott Pruitt was hardly the evil genius of the agency's unsuccessful legal strategies," he said. "Those strategies failed because he was attempting actions that EPA and Justice Department attorneys could not defend. And I believe that Andy Wheeler will attempt actions that EPA and Justice Department attorneys cannot defend, as well." Walke acknowledged that blatant procedural missteps may be less frequent going forward but argued that that's more a result of timing than new leadership. Now 18 months into the Trump administration, EPA doesn't have as many pressing Obama-era regulatory deadlines to dodge, he said. "So I don't see Pruitt's departure fundamentally changing that dynamic," he said. "There has been no space thus far that has emerged between Pruitt's direction and Wheeler's direction, so the success of that rollback agenda will depend upon the law and the record brought to try to defend those rollbacks." Plus, Spalding said, Pruitt wasn't acting alone in his aggressive deregulation campaign. "That wasn't just Pruitt," she said. "That was his whole team. Many of those people are still there." Opponents of the Trump administration's agenda were quick to flex their legal muscle last week, vowing continued pushback on EPA's actions no matter who's in charge. Environmental groups blasted out action alerts and fundraising emails warning of Wheeler's lobbyist past and deregulatory goals. States favoring Obama-era policies promised to hold the new agency head accountable. "I don't think that Pruitt's departure will matter one whit!" said David Hayes, executive director of the State Energy & Environmental Impact Center and a former Obama administration official. "You can bet that state attorneys general will not be letting their guard down," he added. "They will continue to challenge attempts to roll back public health and environmental protections wherever the rollbacks are arbitrary and capricious or unauthorized by law — a statutory bar that, to date, EPA has had a tough time clearing." EPA, meanwhile, has continued chugging along with the president's agenda — as expected. Late Friday night, the agency told The New York Times it would not be enforcing an Obama rule that cracked down on high-polluting diesel trucks. Walke said on Twitter: "This reckless, illegal act — as Scott Pruitt exits EPA tonight — could not have been committed without the support of incoming EPA head, Andy Wheeler."